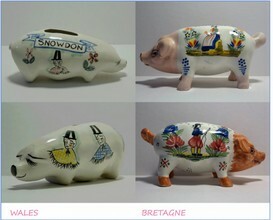 The piggy bank from Wales has another characteristic: It is a pot-bellied pig. This is not often the case with piggy banks, except for some Chinese. 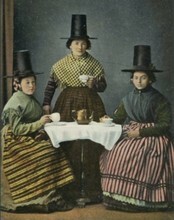 Difficult at the production because it rests on three parts: fore feet, belly and hind feet; where the feet are executed as a 'block'. Always wiggling. 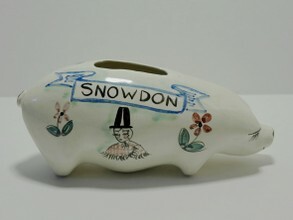 “Souvenir of Snowdon”, the highest mountain in Wales and with its 1085 meters the highest mountain of Great Britain outside the Scottish Highlands. Snowdon is formed from many different types of stone, in Llanberis slate, 400 million years ago this was mud and silt (loam). Then gritstone, clay and siltstone with stones of volcanic ash on top. On top of this a bed of slate with the shells of sea animals. This shows that the top of the mountain was once under water. The Snowdon is known for its “narrow gauge rack and pinion mountain’ railway that has been bringing tourists to the top every day since 1896. Single carriage trains are pushed up the mountain by either steam locomotives or diesel locomotives. You learn that from one souvenir piggy bank. If you have an eye for it at least ... ..